Involvement in service comes naturally for Elder Wm. 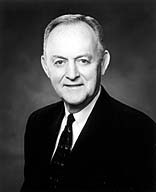 Rolfe Kerr. Service to the Church and community is something he learned from deeply committed parents, he explains, and the desire to serve is a legacy he would like to leave to his children. He made his career in the field of learning, in administrative positions at Utah State University (USU), Weber State College (now a university), the University of Utah, Dixie College (he was president), and Brigham Young University. He was Utah’s commissioner of higher education when called as a mission president in 1993. He will continue as president of the Texas Dallas Mission until July. Born in Tremonton, Utah, 29 June 1935, Rolfe Kerr grew up on a farm. He earned a bachelor’s degree in agriculture from USU, intending to spend his life farming﻿—until he was offered a position as coordinator of student activities at USU after his military service. He later received a master’s degree in marriage and family relations and a doctorate in education. After serving in the British Mission, he met Janeil Raybold at USU. They were married 15 September 1960 in the Logan Temple. The Kerrs have six children. Elder Kerr has been a stake president and has also served in bishoprics and on the Sunday School General Board. For two years in the 1960s, he was involved in helping organize the Latter-day Saint Student Association.